Tada! 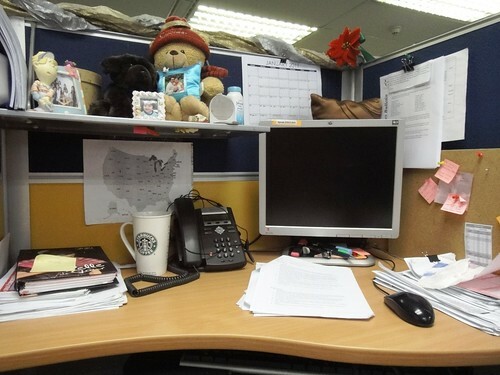 This is my workspace and I spent 9-10 hours of my life during weekdays in this nook. If you notice, I have a small pillow at the back of the monitor. I used that for taking naps during my break time. The Starbucks mug which I used for having my own supply of water while working. Sometimes I put juice or soda on the mug but never a coffee since I'm not fond of drinking one. The stack of papers on the right is the printed job orders that I worked and need to work on. The stack of papers on the left is the scratch papers that I recycled and made them my notepad.